The iPad has replaced a plethora of day to day items that I use in the gym. I used to have to use a clipboard for almost every PE-related task. Now I have a pile of unused clipboards. Attendance, marking and assessment, all of my teaching manuals, all students records (run times, scores, behavior, effort etc.) are all in one place accessible anywhere I have my iPad. Say goodbye to piles of clipboards. I used to have to wear a stopwatch around my neck. Well now that's on my iPad or iPhone. In addition I can now record students times in wide variety of ways. I can take a photo of each student as they cross the finish line with their time superimposed over the picture. I can tap on a students name when they finish a run and their time will be recorded. Or of course I can use a conventional stopwatch-like app as well. I used to write on a whiteboard. My whiteboard is now blank. Skill cues, lessons, teams, instructions, new games, activities and drills used to be written out by hand. Now I can wirelessly project them onto a screen in the gym (thanks to a LCD Projector, an Apple TV, and AirPlay.) Not only are these instructions now large and easy to read (students don't need to try to decipher my messy handwriting) but I can save my instructions for future use. I don't have a electronic physical scoreboard in my gym. Now I have my choice from over a hundred virtual ones. I can use Airplay to project any type of score board I would like. Volleyball, basketball, bowling, judo, darts, general multifunction (keep track of any number of teams at once), you name it. There's an app for virtually every sport specific scoreboard. Changing the score is as simple as a tap or swipe of your finger from anywhere in the gym. Anywhere you go with your iPad you can change the score wirelessly, no more being tethered to a control panel. For added incentive, students often stay much more motivated and on task when they can see the score or progress they are making in a relay, game or activity. …changed the way I record, track and communicate attendance. Gone is my attendance duotang…. Now I use the Attendance app. I can take attendance for an entire class in seconds (more time for students to be active) by simply pressing on a preset response next to a students photo. The app tracks and complies all of that information for me. I can view and email attendance reports and it is all kept in one place. …changed the way I communicate with students and parents. Using the attendance app I can communicate with all the students who were missing from a class via email with the tap of a finger. Or select a class or specific student and communicate via email that way too. Communication has never been faster or easier. …changed the way I observe, take notes and document student behaviour. Gone are piles of sticky notes, and scribbles on lesson plans as a means of recording information and notes on students. Now I can organize any notes or comments on a student by date and time and specifically to them. These are easy to assess and stored in one place. …changed the way I assess and mark in PE. I used to mark with a clipboard, pencil and paper. After marking, I would re-transcribe all of my data into a spreadsheet data base, make averages and calculate grades. Using an iPad, I can record scores and assess skills directly on the device. I can use predefined drop-down menus, steppers, sliders, or enter data by just tapping the screen. I no longer have to re-transcribe any data and my iPad calculates it all for me. The entire process from start to finish has been expedited dramatically through the use of the iPad. I was guilty of commonly using a 5-point scale to assess skills in PE. It was quick, it was efficient, it was easy. I am aware of what movements and actions are necessary to complete a specific skill, those skill cues have been taught to the students, they are posted in the gym, and I could easily assign a numerical value to a students skill. But there was a problem: was this method accurate? Most of the time, yes. Did it offer details a student could use to improve? Most of the time, no. If a student asked why they got a 3 out of 5 on a specific skill could I tell them why? Yes, directly afterwards, but two days later when I've seen over 350 students that I teach? Probably not. The iPad has changed this for me. Now I can use customized specific touch based rubrics to assess PE skills. These are criterion-based. I can put all of the skill cues down that the students learned during classes and have been posted in the gym. I can then check all of those specifc movements and actions off as they demonstrate a skill to me. Now, they have a concrete explanation of why they scored what they did and can use that information to improve. …changed the way I display learning objectives, skill cues, rules, procedures etc. Utilizing the iPad, Apple TV, and a projector I can display anything that appears on my iPad screen on the wall in the gymnasium. This information is now clear, easy to read, and visible from anywhere in the gym. I don't have to spend time at recess, lunch or in-between classes writing on a whiteboard. I can type, draw or take pictures of instructions in advance and display them effortlessly. These can be saved so you never have to rewrite it again. Any diagram, drill, set of rules or procedure can easily be displayed visually to address both auditory and visual learners. …changed the way I make teams and groupings. …changed the way I use timers. Visual timers have a multitude of uses in the gym. The number of students in a P.E. class often outnumbers the amount of positions available to play in a game. Shifts are often utilized to overcome these issues. By timing shifts with a visual timer students have a clear display of the length and interval on a screen. As a result, students can manage themselves better. The question “Are we on yet?” is eliminated, as students always know exactly how long it is until their team is back on the court. This freedom greatly benefits both students and the teacher as you no longer have to “watch the clock”, no more stopwatch around your neck. Now it frees you up to help individual students with a skill or join in a game. No more worrying about the time. Just set a timer the number of intervals, include time for transitions if you wish and preset what teams go on and off at start and end of each shift. Visual interval timers are also invaluable tools for fitness or circuit training. They can also be used for younger students doing skill stations. Students can have stations organized and cleaned up before the buzzer goes off and they transition to their next station. …changed the way I incorporate multimedia into PE. It is simpler than ever before to include media into Physical Education. Why not show students a brief clip on YouTube of the world record long jump when teaching track and field? I can show fourth grade students, learning volleyball for the first year, clips of a grade 12 volleyball game from their own school, so they can see where practicing skills will lead them. Anything on the internet that can be accessed by an iPad screen can instantly be projected onto a large screen. The sky is the limit as to what media you can incorporate seamlessly and easily into P.E. …changed the way I view, use and access my teaching resources. Gone are piles of paper and teaching manuals. Now they are all in one place, easily accessible anywhere you have your iPad. Never go looking for a paper manual again. Create bookmarks for your lessons or any page you wish. Make notes, diagrams any annotation you desire directly on your screen, saved to the page. Print or email any page or range of pages. …changed the way I use a camera during PE. You always have a camera at your disposal. Want to take a video of a student demonstrating a skill? It couldn't be easier. Film, edit and display all on the same device. Film a game and show an instant replay for students seconds after something happens. Help a student develop a skill by filming movements in super slow motion or capture it with a series of super high speed photos at as many as 24 frames per second to isolate or pinpoint and action or form. It is simple to take a video of a skill at the start of a unit and at the end and compare them side by side to demonstrate progress and development. There are apps that make all of these tasks simple and easy to do. 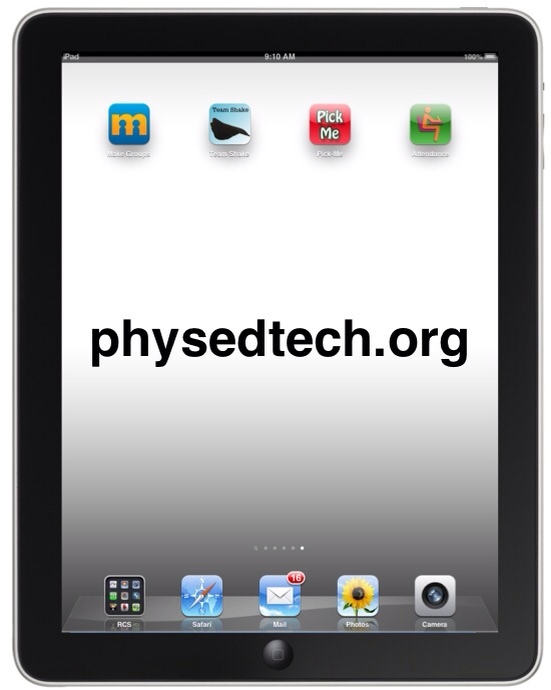 The possibilities and uses for an iPad in PE are endless! The potential of what can be done is virtually limitless. 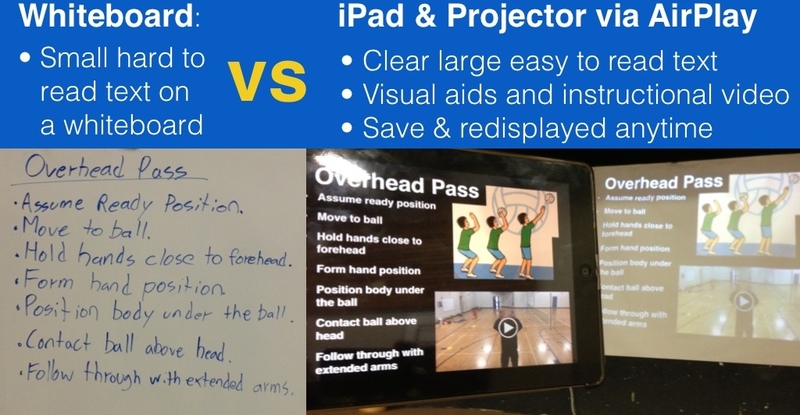 Here were just a few of the ways I utilize an iPad as a teaching tool in physical education. I look forward to elaborating on each of these sections in greater detail in future posts and I am always exited about discovering new ways that this incredible device can used to improve teaching in Physical Education. Next Post Question: Which iPad should I get? The clarity in your put up is simply spectacular and that i can assume you are knowledgeable in this subject. the net. I am going to recommend this website! heads up. The text in your article seem to be running off the screen in Opera. Thanks. This is spam for sure but who still uses OPERA? hours in the daylight, because i like to learn more and more. Fantastico compañero, mas de esto por favor. Me gusta mas uno de estos que cualquier mujer.